Chore-Time's LIBERTY® Broiler Feeder maximizes feed visibility and access while minimizing waste. MILFORD, Indiana, U.S.A. — Chore-Time's LIBERTY® Broiler Feeder’s open grill provides easy access to feed for broilers of all ages and weights. With just four grill struts, the LIBERTY Feeder features openings in the top of the grill to deliver light and air to birds while they eat. The feeder also includes Chore-Time’s patented scalloped grill for greater bird comfort. Raising the outer silver cone high for flooding results in increased feed visibility, and it allows feed to be heaped high to attract young birds. Chore-Time’s LIBERTY Broiler Feeder also offers a variable flood level to give the grower greater flexibility in determining the desired flood level for starting birds along with the ability to vary the level as the birds grow. Flooding can take place whether the pans are on the floor or have been raised into the air. Growers also have the option to manually lock the feeder’s silver cone into the full flood position if desired. The feeder’s rounded pan bottom shape moves the feed out to the pan’s perimeter for easier bird access for eating. 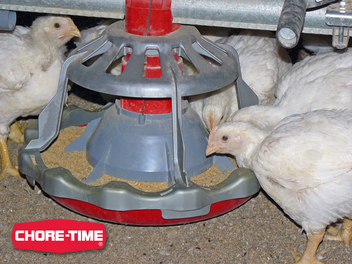 Chore-Time’s LIBERTY® Feeder is also designed to save feed. A feed-retaining lip is formed where the feeder’s grill meets the pan, and the feeder’s cone includes anti-rake fins. Made of non-corroding, all-plastic parts, the feeder features six feed level settings from 0.375 inches (9.5 mm) to 1.5 inches (38 mm) to control the amount of feed dispensed when the feed cone is in the lowest flood position. Chore-Time (www.choretime.com) has been a leading designer, manufacturer and marketer of poultry and egg production systems since 1952. 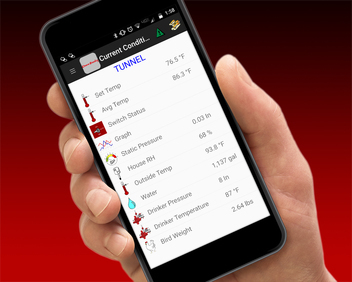 With a complete line of solutions for feeding, feed handling, drinking, egg handling, climate control and management systems, Chore-Time is known for its revolutionary new concepts, innovative features and extensive independent distribution network. Part of the CTB, Inc. family of companies, Chore-Time operates globally from facilities in Indiana, Alabama, the Netherlands and Poland.